Advancements made by iGPUs by AMD and Intel in the recent years essentially destroyed the market of inexpensive discrete video cards. High-performance iGPUs can outperform low-end standalone graphics adapters these days and for a lot of users performance of integrated graphics is enough. Nonetheless, there's still a smaller market for low-end add-in boards - notably as upgrades to true entry-level PCs - and to that end NVIDIA’s partners this week released a new breed of low-end graphics cards targeting entry-level PCs. The new NVIDIA GeForce GT 710 video cards are based on a cut-down version of the company's existing GK208 GPU, with 192 stream processors, 16 texture units and 8 ROPs. As this is a Kepler architecture product, you'll find baseline support for Direct3D feature level 11_0 but not newer features found in the Maxwell generation such as HDMI 2.0, which is likely why NVIDIA opted to launch this as a 700 series product. Peak compute performance of the GPU when clocked at 954 MHz is around 366 GFLOPS, which is below that of contemporary higher-end iGPUs by Intel or AMD. The GeForce GT 710 graphics cards are equipped with 1 or 2 GB or DDR3-1800 memory featuring 14.4 GB/s bandwidth. Makers of graphics cards position their NVIDIA GeForce GT 710 boards as solutions for entry-level PCs running Intel Celeron or Intel Pentium processors with mediocre iGPUs, and these are typically the comparisons you'llsee vendors make as it doesn't take much to surpass low-end iGPUs. That said, while the GeForce GT 710 can indeed be considerably faster than outdated integrated GPUs, it is unlikely that it can enable decent performance in demanding video games, and this is more likely to be pitched as a card for MOBAs and similar low-impact games. From a sales perspective, since the GK208 GPU is not a new graphics chip - having been launched back in 2013 - it is somewhat surprising to see that virtually all partners of NVIDIA decided to release their new video cards powered by the GPU. The market for such adapters is very limited these days because 100% of entry-level PCs use iGPUs. Moreover, even in countries like China, where inexpensive hardware is sold in large quantities, more and more gamers are adopting higher-end discrete video cards, according to media reports. Meanwhile from a technical perspective, as the GeForce GTX 710 are designed for low-end PCs, many of such video cards come in half-height/half-length form-factor. Typical for low-end cards (especially those expected to sell well in the APAC market), all of the GT 710s we've seen so far feature D-Sub analogue monitor output for compatibility with older monitors, along with the more typical DVI and/or HDMI/DP connectors. Meanwhile GT 710 is rated for a TDP of just 20 W, so many of the cards use passive cooling solutions, while the rest feature small fans. The NVIDIA GeForce GT 710 graphics cards are available from companies like ASUS, EVGA, Galax, Gigabyte, Inno3D, Palit Multimedia, Manli, MSI, ZOTAC and some others. 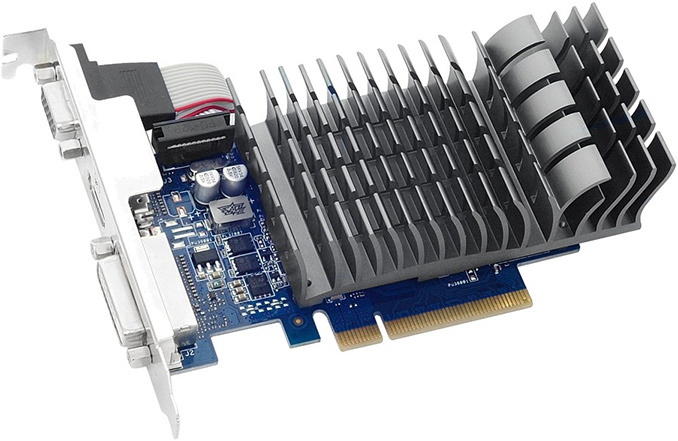 Prices of the GeForce GT 710-based graphics adapters vary, but typically such cards cost from $30 to $50 in the U.S.